Posted 16 January 2014 & filed under 1930s, Dorothy Grummit, Life and leisure, Places and spaces, Railways, Streets, Watercress industry. 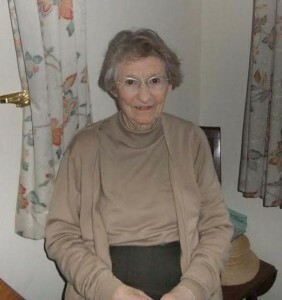 Dorothy Grummitt lives in Albeny Gate but was born in Gateshead. In the 1930s, she often used to visit her aunt and uncle in Park Street, St Albans. Her uncle worked as a carpenter at Handley Page in Radlett. He moved south because of the depression. Later, her family moved to St Albans in 1959. Dorothy remembers borrowing a dinghy and rowing along the river Ver from Park Street to Holywell Hill. This stopped when the A414 and the park Street roundabout was built. She has many memories including the trains to Watford, Pinnock’s watercress beds in Burydell Lane, walking across the fields to St Albans and coming home on the 355 bus. She also remembers playing dominoes with her uncle. Interview date: 8 October 2013. Interviewers: Rick and Jennifer Taylor.